A synthetic diamond is chemically, physically and optically a real diamond, though grown in a machine rather than mined from the ground. They are commonly called man-made, lab-grown, lab-created or cultured diamonds (a term not favored by International gem standards organizations, as they feel it is deceptive or unfair, even though by definition [produced under artificial and controlled conditions], cultured is not incorrect.) and can be grown in yellow, blue or white/colorless through a couple methods. Synthetic diamonds were first produced in the 1950’s by GE and ASEA using large “belt” style presses. These diamonds were small and heavily included with poor colors, so were far from being gem quality. Through the 70’s and 80’s, smaller “cubic” presses were developed and were able to grow gem-quality sizes, but still produced mainly brown and yellow industrial diamonds. In the late 80’s and early 90’s, a “BARS” press was developed in Russia which, to-date, is the most effective method of growing a large gem-quality diamond. BARS presses are able to grow rough diamonds up to six carats, though the polished yield depends mainly on growth cycle duration and inclusions throughout the rough diamond. All of these machines create a high pressure and high temperature (HPHT) environment where carbon atoms slowly build upon a tiny diamond seed in a molten metal solution. Diamonds grown using HPHT technology can be most easily made in fancy yellow colors because it is very difficult to exclude nitrogen from the diamond’s crystal lattice. The nitrogen assists the growth of the diamond, speeding the process and making yellows the easiest and fastest color to grow. Fancy blue colors can be grown by trapping boron in the diamond lattice instead of nitrogen, similarly helping the speed of growth, but growing slower and therefore at greater cost than yellows. Colorless diamonds can be made by limiting nitrogen and boron from entering the diamond lattice. By removing these “helper” elements, the speed of growth is slowed, so the heat and pressure have to be sustained longer for a comparably sized colorless diamond. The longer the growth cycle, the more challenging it is to control the color and limit the inclusions, which is why colorless diamonds are the most difficult to produce. 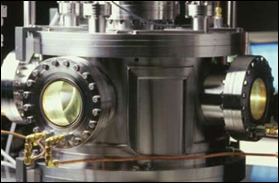 In the 80’s, another process emerged for growing diamonds called chemical vapor deposition (CVD). This process uses carbon-laden gases, such as methane, in a low-pressure heated environment, using microwaves as an energy source. Plasma breaks apart the gasses and the carbon “rains” onto a diamond seed. This process primarily produces brownish and near-colorless diamonds, with their size limited by the thickness of the diamond wafer. Many CVD diamonds are then HPHT color treated to turn brownish and off-white colors into more desirable colorless and near-colorless diamonds. While all synthetic or man made diamonds are in fact real diamonds, there are various methods and testing equipment available to identify a diamond’s origin, as well as to detect non-diamond simulants. 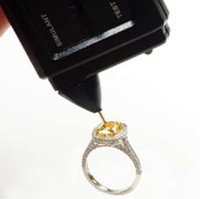 A common thermal diamond tester will accurately identify both mined and synthetic diamonds as real diamonds and stimulants, such as cubic zirconium, as being made of different substances as real diamond. Electrical conductivity tests are commonly used to detect simulants like Moissanite. They will correctly identify all white and yellow synthetic diamonds as non conducting real diamonds. All blue diamonds, mined and lab-grown alike, are electrically conductive, so will return false positives for any blue diamond when tested with very simple electrical conductivity tests. More advanced tests can further identify synthetic diamonds. HPHT diamonds grow in a molten metal solution, so inclusions are metallic, while mined diamonds grow in molten rock and do not have metallic inclusions. Fourier transform infrared spectrometer (FTIR) or energy dispersive X-ray fluorescence (EDXRF) can both detect trace amounts of metal in HPHT-grown synthetic diamonds such as iron, nickel and cobalt introduced from the growth environment. Synthetic diamonds have both octahedral and cubic growth sectors, while mined diamonds only have octahedral sectors, which can be detected using a cathodoluminescence (CL) spectrometer. De Beers has also developed two machines, DiamondSure and DiamondView, which measure the light absorption at specific wavelengths and shortwave ultraviolet fluorescence, respectively, to identify synthetic diamonds. GIA, EGL, IGI and other gem labs offer grading services for synthetic diamonds and disclose the diamond’s origin in the grading report. Furthermore, most producers laser inscribe all of their polished diamonds .30cts and larger, which can be read with 10-20x magnification. Synthetic diamonds are grown in three primary colors: yellow, blue and white/colorless. 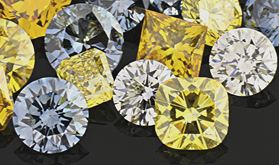 Yellow diamonds grow the fastest, so cost the least and are available in the largest sizes. They typically range up to two carats polished, though some exist up to four carats. Blue diamonds are available up to about 1.50ct. Gem-quality white diamonds are the most difficult color to grow, with limited availability up to one carat. HPHT color treatment of yellow synthetic diamonds can produce yellowish-green colors while irradiation can produce pink, purple, red and vivid green colors. Most diamonds over 1/3 carat come out in vivid, deep and dark colors. Depending on the color, irradiated diamonds may also require further high temperature heating (annealing). Irradiation is a safe procedure where the diamond is bombarded with electrons, which alter the diamond’s crystal lattice. Pink, purple and red colors are stable to around 800°C and greens are stable to around 350°C. This type of irradiation has no residual dangerous half life. By now you probably get the idea that there is a lot of very expensive science, technology and closely guarded and patented secrets as barriers to entry for new players. One diamond growth machine costs hundreds of thousands of dollars, with an output of only a few diamonds per month. Synthetic diamond production is the creation of a raw good, which can best be compared to an industry like steel, rather than assembled goods like computer chips or electronics. While there will be progressive improvements to increase yield and quality, synthetic diamond prices should remain relatively stable in the coming years. Having a diamond come from a machine rather than the ground comes with certain advantages and disadvantages, depending on your perspective. These high-tech diamonds are “brand-new”, grown in roughly a week, rather than being potentially 100’s of millions of years old. They are grown by scientists and only use a modest amount of electricity and resources, so do not share the environmental impact or “conflict” and labor issues sometimes associated with mined diamonds. 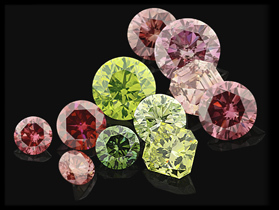 Colored synthetic diamonds are much more cost-effective with greater availability than their rare mined counterparts, which can provide affordable jewelry designs not otherwise possible using fancy colored mined diamonds. White diamonds are the most sought after and available color in mined gem-quality diamonds. It is the most difficult color to grow in the laboratory, so availability of synthetic white diamonds is still quite limited, with prices comparable to mined white diamonds. 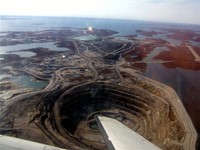 Other options for white diamond shoppers concerned about mining impact could consider estate or second-hand diamonds and those concerned about labor issues could consider diamonds mined from Canada, Australia, Russia, Botswana or other conflict-free regions. A synthetic diamond is a real diamond and comes with its own benefits and drawbacks. Ultimately, it is up to you as the consumer to decide if a synthetic diamond is right for you and your desires. 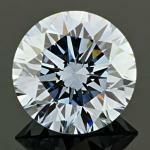 For more discussion about synthetic diamonds, visit Pricescope’s Laboratory-Grown Diamonds / Man-Made Diamonds (MMD) forum. A simulant is not a diamond and does not have the same chemical, physical and optical properties as a diamond. Be aware there are many companies selling simulants (e.g. fake diamond, cubic zirconium, moissanite, diamond coated CZ, etc.) and attempting to pass them off as synthetic/man-made diamonds, or using very confusing or misleading terminology to describe their products. As stated above, white synthetic diamonds are very rare with limited quantity and sizes, with prices comparable to mined white diamonds. If you come across a product seeming to be a white synthetic diamond, if it is not from either of the two white diamond producers above and priced at around the same cost as a natural diamond, proceed with extreme caution and do your research, as there is a high probability it is a simulant.